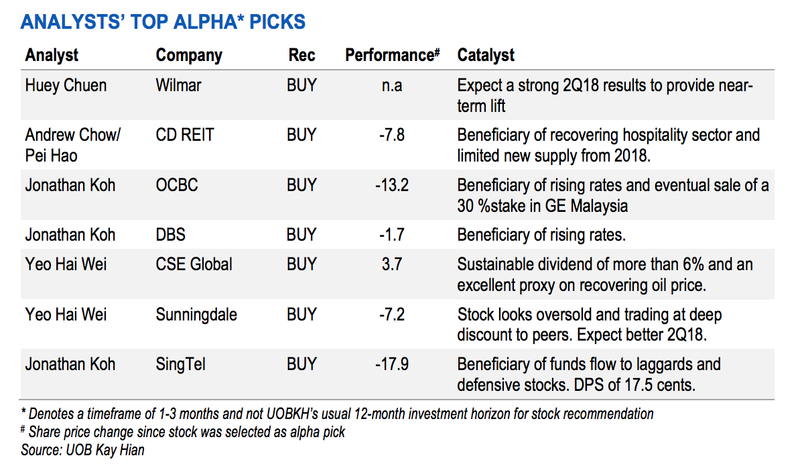 Our portfolio enjoyed a pick-up in performance after a challenging June. We lean towards large caps, and stocks with reasonable dividend yields or near-term catalysts. Conversely, developers have been removed owing to a lack of catalysts and weaker take-up rates after the recent property cooling measures. 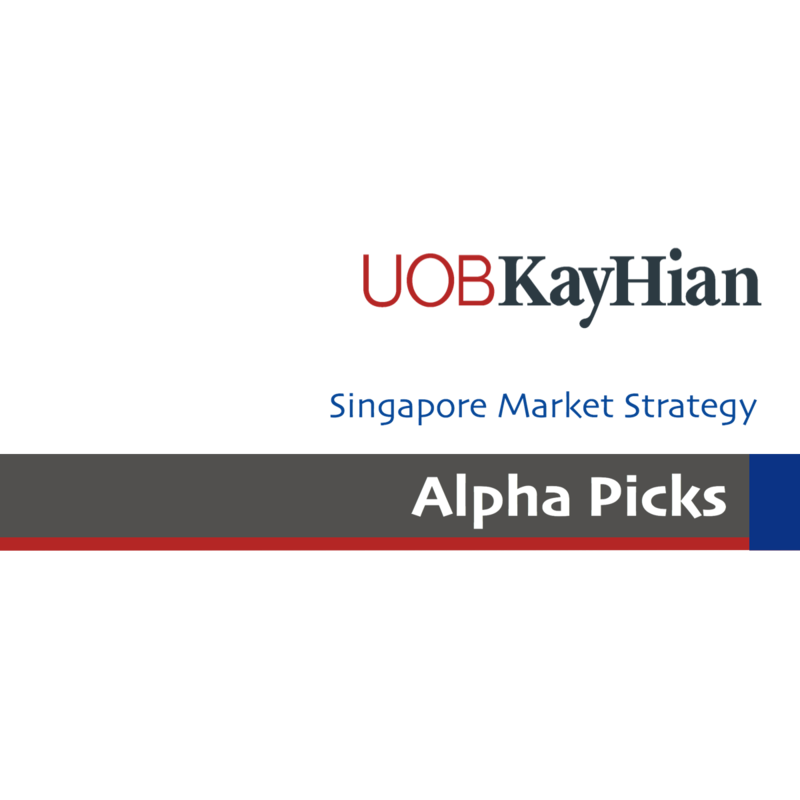 Our portfolio delivered a good rebound in July with the alpha picks rising 3.2-7.0% during the month. The only exception was City Developments (- 8.4% m-o-m) and banks (by up to -0.6% m-o-m), which declined on property cooling measures announced on 5 July and external uncertainties respectively. Adjusting our portfolio to reflect recent developments. We remove City Developments and Wing Tai from our portfolio despite our view that these stocks look undervalued and financials are strong. Key is the lack of catalysts after the recent property cooling measures, which is expected to impact home buying sentiment and positive newsflow in the near term. Share price correction. The stock has declined 5.4% from its recent high and is currently trading at 11.6x 2018F PE, which is lower than its 5-year mean of 13.6x PE. 2Q18 will be an unusually good quarter for Wilmar. We are expecting a core net profit of around US$260m-290m. This would make 2Q18 the best 2Q for Wilmar. Key trends to look out for are better contribution from the sugar division due to higher milling sales volume, better oilseeds & grains PBT margins, and contribution from tropical oil is expected to be better in 2Q18 on the back of higher sales volume and contribution from biodiesel. Event: Expect unusually good 2Q18 earnings, M&A newsflow. We estimate that implementation of internal ratings-based approach (IRBA) to compute risk-weighted assets for OCBC Wing Hang in 2019 would improve CET-1 CAR by 0.6ppt. The group may also evaluate reinstating scrip dividend scheme as a tool for capital management to support a higher dividend payout ratio. Event: Rising interest rates could help underpin NIMs. The divestment of a 33.3% stake in Hong Kong Life Insurance for HK$2,366.7m (S$425.9m) is waiting for regulatory clearance and should be completed by end-18. Management confident of achieving ROE of 12.5% for 2018. DBS is a prime beneficiary of rising SIBOR and SOR due to stable Singapore dollar CASA ratio at 91.5%. It has also strengthened deposit franchise in Hong Kong with Hong Kong dollar CASA ratio improving 6.2ppt y-o-y to 58.4% in 1Q18..
Management guided for loans growth of 8% in 2018. Together with its generous dividends (dividend yield of 4.5%), DBS remains a core holding as a growth proxy. We have a target price of S$1.86, which assumes a terminal growth rate of 2.5% and risk-free rate of 2.75%. Hotel room supply is limited beyond 2017, with only 769, 1,664 and 392 rooms coming on-stream in 2018, 2019 and 2020 (compared with 2,868 new rooms in 2017). Even with the new land for hotels included under the 2H18 Government Land Sales (GLS), new supply (potentially 930 rooms) will only come on-stream after 2020, which suggests tight near-term supply. Event: Positive data points on visitor arrivals, average length of stay (ALOS), average daily room rate (ADR), RevPAR and supply pipeline. Positive results from new operator and repositioning of its Maldives Hotel. Optus is gaining market share in Australia and TPG Telecom’s commercial launch could be blunted by the lack of traditional voice services. The group is least affected by a fourth mobile operator in Singapore as overseas businesses account for about 70% of its bottom-line. BUY with a target price of S$4.22. Event: Funds flow into laggards and defensive stocks, including Singtel which offers a good dividend yield (DPS commitment of 17.5 S cents/share for 2 years). Opportunity after correction. The stock has retraced 34% from its recent high and is currently trading at 0.7x P/B and at 8.2x 2018F PE, which is significantly cheaper than its peers, including Memtech. Hoping for a better 2Q18 to provide relief. Investors have been shaken by a weak 1Q18, exacerbated by forex losses. We see the potential for a forex gain in 2Q18 as the US dollar has gained 3.9% q-o-q vs the Singapore dollar, as well as potential gains in 2H18 from the sale of a non-core factory in China. Price currently below major shareholder’s last purchase. After the price retracement, Sunningdale is trading at a 20% discount to the last acquisition price of S$1.71 (13m shares) by its chairman Koh Boon Hwee. Event: Recovery in 2QFY18 earnings (including forex gain) and gains from disposal of its non-core asset in 2HFY18. Solid proxy on recovering oil prices. CSE is a good proxy of recovering oil prices as two-thirds of its existing orderbook of S$175m comes from the O&G sector. In addition, the stock offers sustainable dividend yield of more than 6%. High entry barriers. The group has a 32-year track record in a business with high entry barriers. CSE is one of the few qualified system integrators in the region for O&G and communication infrastructure industries. Potential synergies from new shareholder. Serba Dinamik, a Malaysian-listed company, recently bought a 25% stake in CSE at S$0.45/share. We see potential synergies as it could open up new markets for CSE such as Malaysia and Middle East. Event: New contract wins and continued recovery in earnings. Newsflow of positive ts new shareholder Serba Dinamik.